As the nation’s favourite holiday park operator, we offer the widest choice of lodges, holiday homes and locations. Which means we can help you find your perfect holiday hideaway, no matter what your taste, requirements or budget. Our lodge-style models are our most popular. They promise all the stylish features of a premium lodge, but at a more modest price tag. Step inside and you’ll discover cosy furnishings, chic design and all the modern conveniences you need from a luxurious, yet practical holiday home. 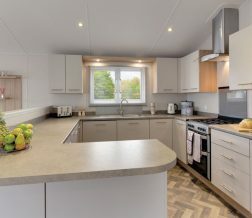 Many caravan holiday home owners have upgraded to a lodge-style model in recent years. They value the extra space, cosy interior and superior build quality and style that a lodge-style home brings. And of course, they’re still in the most idyllic coastal and countryside locations. The UK’s leading holiday home manufacturers have used their specialism to create some truly spectacular lodge-style models. 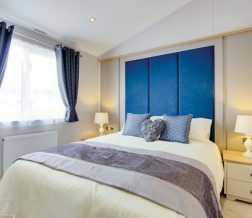 Built to an exceedingly high specification, models such as Clearwater, Pinehurst and Portland by Willerby, and the ABI Harrogate, provide the most opulent escapes. Lodge-style models are available at most of our locations, so for a taste of luxury lodge living, and for a glimpse of your new restful lifestyle as a holiday home owner, arrange a visit with our team of experts.